Coming Soon! Ambient is introducing a range of quality water underfloor heating systems to complement our amazing electric floor heating kits! Our new plumbed systems will bring you the same unbeatable value for money along with the exceptional customer service you’ve come to expect from Ambient. Extensive research into the heating market has found that the demand for low pressure hot water (LPHW) or ‘wet systems’ has doubled in the last ten years. These systems rely on radiant heat rather than traditional convection, so the room air temperature can be around 2°C lower and still be comfortable. 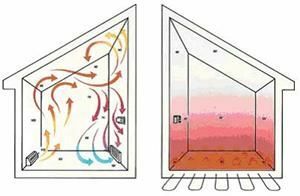 A radiant system emits more useful heat as it warms surfaces rather than the air around the surfaces. A water-based underfloor heating system works with almost any type of flooring, including tile, stone, wood or even carpeted surfaces. It is more complicated to install than electric underfloor heating, and more expensive, so it is typically favored in new build housing and major refurbishments where a new floor is being laid. If you require a system for a single room such as a kitchen, bathroom or conservatory, you may want to consider electric underfloor heating, which involves laying pre-wired mats or cables between a substrate and the flooring surface. 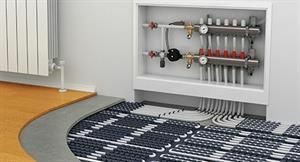 With a water-based underfloor heating system, pipes connected to a boiler circulate warm water throughout the floor to heat the space. These pipes can also be connected to a a solar water heating system or ground source heat pump. By heating the room from the floor level upwards, the boiler consumes less fuel, which in turn means lower running costs and less environmental damage. We recommend you use a qualified installer when fitting the under floor system, although DIY is possible. The installation time will be roughly a third of that needed for a radiator system and it is relative simplicity means that there is less skill required. All tools your contractor uses should be available from an ordinary plumber’s merchant.